Following a storied career with Liverpool and the England National Team, Steven Gerrard made the increasingly-common trip across the pond to the MLS. While his best years are certainly behind him, Gerrard aims to cement his legacy in the United Sates, and his card market should enjoy a boost if he finds success. The list below looks at some of the top overall cards for Steven Gerrard. Shop for Steven Gerrard cards on eBay. After entering the Liverpool Academy as a nine-year-old, Steven Gerrard spent his entire career with The Reds. Gerrard signed his first professional contract with Liverpool in 1998 and joined the national team the following year. Nearly two decades later, Gerrard is one of the most decorated players in Premier League history and the face of Liverpool. Gerrard retired from the national team in 2014 and ended his career with Liverpool in 2015. Similar to other soccer greats, especially David Beckham, Steven Gerrard took his talents to the MLS to finish out his career. Gerrard made an immediate impact for the Los Angeles Galaxy, scoring a goal and adding an assist in his MLS debut. While his current contract only locks him into one full season in the MLS, he has plenty of time to make his mark on the upstart league. Playing for one of the top MLS teams in a large market should help collecting interest for Gerrard. 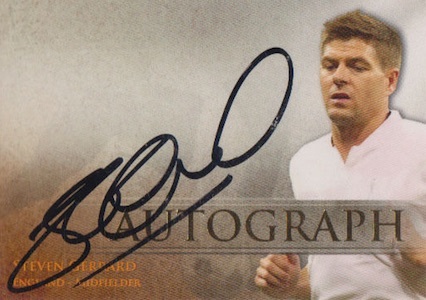 Low-end stickers and game cards are the most common options from Gerrard's Liverpool days, but several standouts are available, including a handful of autographs. With MLS cards likely on the way, products that feature Gerrard will offer another popular option in the future. This will be especially true if there are autographs. 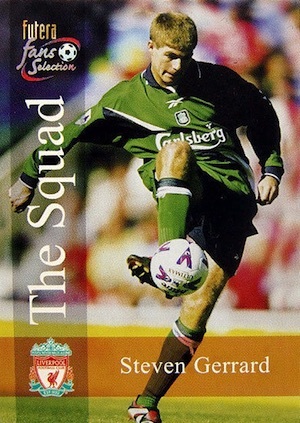 The earliest option for Steven Gerrard is a sticker card. Part of the update set, these simple cards showcase a youthful Steven Gerrard and rarely surface. 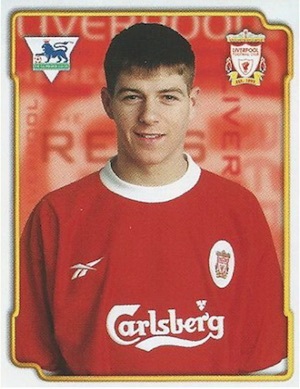 As one of the first traditional cards for Steven Gerrard, the 2000 Futera card is popular but quite limited. The card is found in the Liverpool Fan's Selection release. 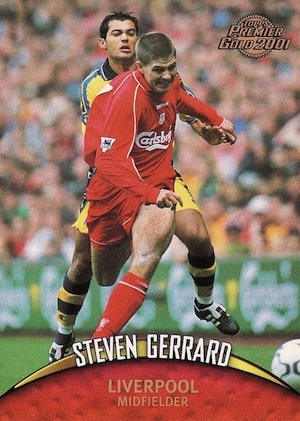 Another key early card for Gerrard, 2000-01 Topps Premier Gold relies on a large action image and blurred background. These are also tougher to track down. Offering one of just a few autographs for Steven Gerrard, the signed Futera cards are further bolstered by on-card autographs. However, the airbrushed jersey gives the card a generic feel. Included in the fairly stacked 2013-14 Topps Premier Gold autograph checklist, this Steven Gerrard card features a a sticker autograph and several limited parallels, including Gold (#/50) and Orange (#/25). One major positive is the Liverpool jersey. 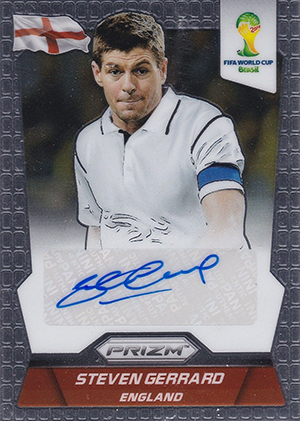 Another instance of an airbrushed jersey for Gerrard, 2014 Panini Prizm World Cup was one of the biggest products of the year. 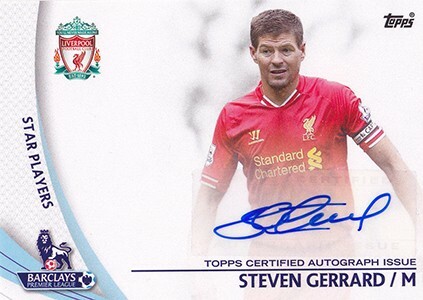 The autograph checklist is deep with global stars and Steven Gerrard is an appealing choice for collectors. There is also an additional signed card that pairs him with English great Bobby Charlton.